DESCRIPTION FROM THE PUBLISHER: This is an artist-led picture book, which introduces young children to the vastness of the universe, how far away the moon is, what gravity is and the concept of space travel through a gentle and captivating story about an imaginative little girl. 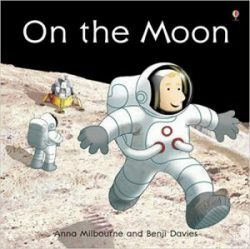 Combining full colour illustrations with NASA photographs from the surface of the moon, this beautifully illustrated picture book takes young children on an amazing journey into outer space. The story’s use of rhythmic text generates an evocative and friendly tale, taking children on a magical and informative journey.